I've loved cycling for many years. What is it about cycling that I find appealing? I think it's the accessibility and the fact that you don't have to be the best to get something out of it. Recently I've struggled with my cycling mojo and aside from a few short rides, commutes and turbo sessions I haven't had a decent day out in the saddle in ages. Today was the Tom Simpson Memorial Ride and something I'd had in my calendar since I rode it last year. What is the Tom Simpson ride you say? 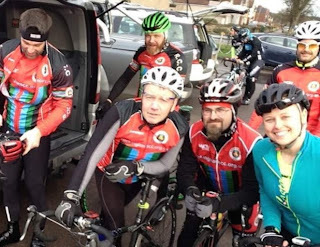 It's an annual ride that's pretty much like the Cannonball Run for cyclists. 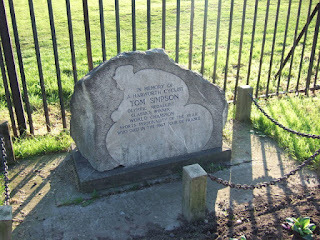 But who's Tom Simpson you ask? 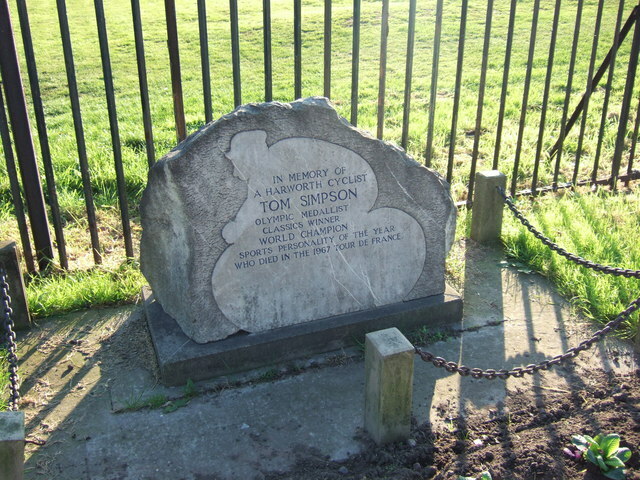 Thomas Simpson (30 November 1937 – 13 July 1967) was one of Britain's most successful professional cyclists. He won a bronze medal for track cycling at the 1956 Summer Olympics and a silver at the 1958 British Empire and Commonwealth Games. He won the 1961 Tour of Flanders and in the 1962 Tour de France he became the first British rider to wear the yellow jersey, finishing sixth overall. In 1965 he became Britain's first world road race champion and won the Giro di Lombardia; this made him the BBC Sports Personality of the Year, the first cyclist to win the award. He won two stages of the 1967 Vuelta a España before he won the general classification of Paris–Nice that year. In the thirteenth stage of the 1967 Tour de France, Simpson collapsed and died during the ascent of Mont Ventoux. He was 29 years old. The post-mortem examination found that he had mixed amphetamines and alcohol; this diuretic combination proved fatal when combined with the heat, the hard climb of the Ventoux and a stomach complaint. A memorial near where he died has become a place of pilgrimage for many cyclists. Simpson was known to have taken performance-enhancing drugs during his career, when no doping controls existed. He is held in high esteem by many cyclists for his character and will to win. I did this ride last year, it's a pretty flat course and aside from getting a little lost I loved the experience. I set out from home at 7:40am, it was a little chilly and I did initially think "why" as I headed off on the cold Sunday morning ride to the start point about 20 kilometres away. I made great progress and quickly got into the ride out. I arrived at Bircotes and Harworth Sports and Social Club (the start point) in about an hour, which I was pretty pleased with. I met up with other members of my cycling club out there and after a bit of chat it was time to set off. The plan was not to stick together but to get around at our own best pace, it's not a race (but some might treat it like it is). As well as cycling clubs from around the area the event attracts a number of pro riders, I've never seen them at the club but I have seen their efforts later on Strava so I know they were there. 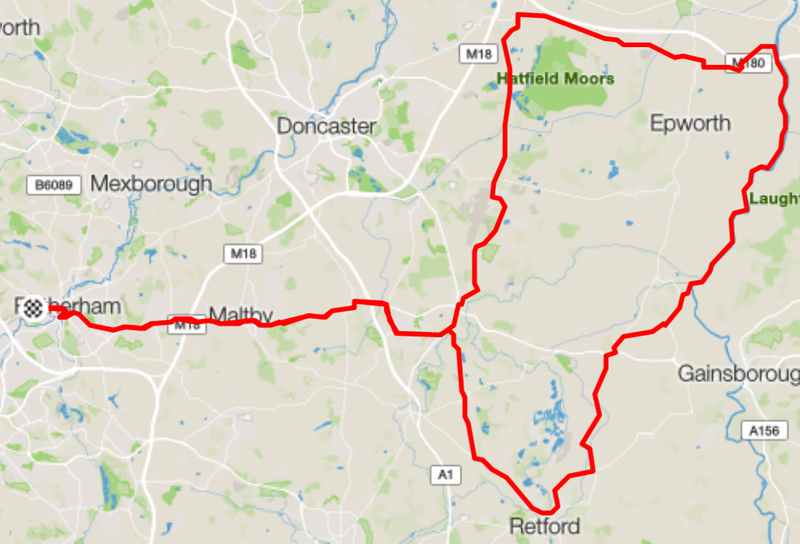 The route is basically like a big square, you head south to Barnby Moor then east through Retford before heading north through Gringley on the Hill (the only real climb on the course) and following the river Trent until just after West Butterick when you head west. At Hatfield you finally turn south and ride through Finningley and Bawtry before returning to Bircotes. We set of and the southern journey was very fast paced. There were a large number of other cyclists and in the melee I was separated from my club friends (this was expected). I continued at a good pace and quickly found myself in Retford. I continued as the route took me north and up the only hill on the course (at Grindley on the Hill). I followed the river Trent north and made contact with Kate from my club who rode with me for most of the remaining ride. As we just past West Butterwick we turned west and it was here we were battered by a strong crosswind. The ride suddenly turned nasty as I rode against the winds until we reached Hatfield Woodhouse. Turning south to what was the final leg of the route the wind was then in our faces. Not only was I battling the miles I had a headwind to cope with now. 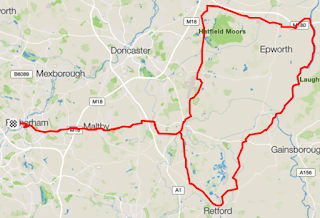 I persevered through Finningley and I took heart that the next town would be Bawtry and I knew that was near the finish. Now like the corridor scene in the movie 'Poltergeist' (1982) Bawtry seemed to be moving away from me faster than I could cycle towards it. The pace and conditions and the fact that I hadn't taken in enough food finally took it's toll and I had to stop and eat. I took 5 minutes to rest and eat (I've always got plenty of flapjack and energy bars). It's difficult to bounce back from a bonk but I took it steady, Bawtry finally arrived and I made it to the finish. It was a gruelling ride and.... wait, I was still 20km from home! I took on some more food and steadily made my way home. I grew stronger as I progressed and as I neared home I was again feeling back up to my full strength. I arrived home safe and well although I was physically drained. After all that I wasn't about to start cooking so I book us all a table at our local Toby Carvery.